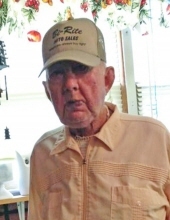 Carl Eugene Richardson, son of the late Albert H. and Martha “Maggie” (Deavenport) Richardson, was born July 15, 1934, in Texas County, Missouri, and departed this life March 21, 2019, at his home in Mountain Grove, Missouri. He was 84 years, 8 months, and 7 days of age. Carl grew up in the Success area. He married Esther Lavern Hutsell on May 25, 1958. Five children were born to this union. Carl and Esther moved to Mountain Grove where they spent the rest of their lives. Carl absolutely loved selling cars. He worked hard at his car lot, Bi-Rite Auto Sales, for more than fifty years, until his passing. In his spare time, he greatly enjoyed fishing. He had a favorite fishing spot in Arkansas that he would visit as much as possible. He also greatly enjoyed spending time with his grandkids. At night, a favorite activity of his was to sit in his favorite chair, have his favorite snacks, and watch his favorite shows like The Voice and Andy Griffith. Besides his parents, Carl was preceded in death by his wife of 55 years, Esther Richardson, three sons, Carl Gene, Steve Allen, and David Wayne Richardson, and one daughter, Connie Lavern. He is survived by one son, Randy Richardson of Cabool, Missouri, one brother, Pearl “Bud” Richardson of Houston, Missouri, one sister, Alma Staab of Florissant, Missouri, six grandchildren, Zach Richardson, Ariah Richardson, Summer Richardson, Cameron Richardson, Tori Healy, and Johna Richardson, four great-grandchildren, Kaden, Carter, Asher, and Marlea Richardson, and many other relatives and friends who will miss him dearly. To send flowers or a remembrance gift to the family of Carl E. Richardson, please visit our Tribute Store. "Email Address" would like to share the life celebration of Carl E. Richardson. Click on the "link" to go to share a favorite memory or leave a condolence message for the family.